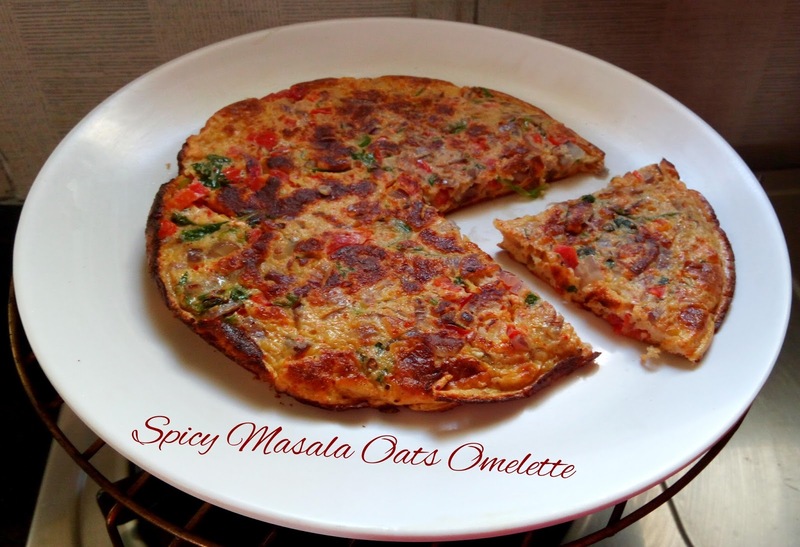 Spicy masala oats Omelette is a healthy ,nutritious breakfast. This is what one needs to start their day with…. ,and if it’s a busy morning ,then definitely you should be looking for this tasty ,nutritious and healthy breakfast ,which can be prepared in jiffy …..! What can be better option than an Egg for breakfast as it is full of protein and keeps you energised till your next meal. Adding Oats and few veggies to Egg…..,makes it more colourful fibrous and super nutritious.What more one can expect in an healthy breakfast ?You can add carrot,beans ,capsicum,cabbage,mushroom,peas and also greens of your choice to make it more healthier. Though adding potatoes enhances the tastes,i don’t recommend it for weight watchers as oats itself gives you the necessary carbohydrates and there is no need for extra carbs from starchy potatoes. For all those who wants potato along with omelette,omit oats and go ahead only with potatoes,you can even refer my post spanish potato omelette recipe .Add protein to your diet. eat right,be active and stay fit. Nutritious ,Healthy and Tasty Breakfast to kickstart your day. Ground Oats to a powder in a mixer and make Oats Flour. Add all spice powder and salt to oats flour . Add oats flour with spices ,all chopped veggies to egg.Mix well together. Heat 1 Tsp oil in a nonstick pan,pour the egg batter ,and cook on medium heat for 3-4 minutes till base become firm. Now flip and cook on other side for 3 more minutes. or till done. Serve Oats omelette ,hot or warm . Adding milk , helps to get a fluffy omelette . In a mixer add oats,and all spice powder,salt and ground to a powder. Take eggs in a bowl,add salt and seasoning ,beat well with the help of wired whisk. Add powdered oats,beat well,add milk and mix it. Adding milk would give you a fluffy omelette. Add all chopped vegetables and greens of your choice,mix well. Heat oil in a nonstick pan,pour egg-oats batter ,close and cook on medium heat for 5 minutes. Once the base becomes firm,flip it and cook on the other side too for 2-3 minutes. Cut it into wedges and Serve it hot or warm. For a complete and balanced breakfast ,pair it with any fruit or fruit juice . Hey Poorna, Good to know that u found it interesting.You might even like Spanish Potato Omelette , do try and let me know.